The public pledge of allegiance to Al-Qaeda by Syria's fiercest rebel group, Al-Nusra Front, serves the interests of President Bashar al-Assad's regime, analysts say. "It's a point in the regime's favour because it reinforces the official narrative that claims (the army faces) terrorist groups backed by foreign forces," said Damascus Centre for Strategic Studies head Bassam Abu Abdallah. 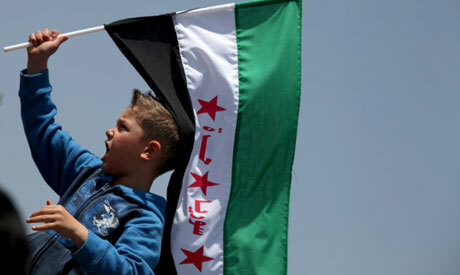 "The opposition's stance is weakened before Syrian and international public opinion," he said. Al-Nusra Front's chief Abu Mohammed al-Jawlani pledged allegiance on Wednesday to Al-Qaeda head Ayman al-Zawahiri, who is calling for an Islamic state in Syria and the "restoration of an Islamic caliphate". "The Syrian opposition cannot justify to the Europeans the jihadist presence in Syria. What will it do after this announcement? It's embarrassing for the West which is calling for democratic change in Syria," said Abu Abdallah. The mainstream Free Syrian Army, which says it is fighting to establish a democratic state, the Syrian Islamic Liberation Front, the more hardline Syrian Islamic Front, and Al-Nusra Front. Experts say the Free Syrian Army comprises some 140,000 fighters, while Islamists number around 8,000. But the Islamists are better equipped and have impressed the population. Al-Nusra's pledge to Zawahiri, and claims of ties between the group and Al-Qaeda's Iraqi branch the Islamic State of Iraq, were not well-received by some rebel brigades. "Liwa al-Islam's command believes that this announcement will be an excuse for the tyrant Bashar al-Assad and his cronies... to commit more massacres against Syrians, under the pretext of fighting Al-Qaeda," the group said in a statement. After Al-Nusra's pledge of allegiance, Abu Abdallah believes the regime will now go all-out on the battlefield. "It's a green light for the authorities," he said. "The situation has become clearer. We are going to see major change on the ground, and intensified military operations to finish this group off," he added. In combat zones across Syria, troops and rebels appear to have reached a stalemate, except in the south where insurgents are advancing. The regime still holds the coastal areas and major cities -- barring Raqa in the north and large parts of Aleppo -- while insurgents control large swathes of northern and eastern Syria. But Al-Nusra's pledge is mainly seen as damaging to international public opinion. "It certainly puts Western states who oppose Assad's rule in a sticky situation," said Charles Lister, an analyst at IHS Jane's Terrorism and Insurgency Centre. "The West has suspected... Al-Nusra of having Al-Qaeda ties for a long time, and that may well be a key reason for not wanting to arm any rebel group." Despite the difficulties, rebels may have a tough time cutting Al-Nusra out of the picture. "Al-Nusra fighters have acquired a reputation inside the wider insurgency for military prowess and impressive bravery. They've been involved in nearly every single major rebel success in Syria since August or September last year," Lister added. For Thomas Pierret, an Islamic expert, "all one needs to do is look at the Western media frenzy" to realise the resonance of Al-Nusra's announcement. "Assad can logically conclude that his opponents' ideological excesses are more worrying to the West than the tons of explosives he is pouring each day on his population," said Pierrot, a lecturer at the University of Edinburgh. Rather than embarrass the West, the announcement has only given it "a new, comfortable pretext to justify their inaction. Despite what they say, somewhat unconvincingly, they don't really want to help the opposition," he said. If the International Community had not waited so long to put an end to the massacres, they would not be facing an opposition they dislike. A protracted conflict will only bring more chaos and extremism and it is in no one's interests (US nor Iran) to allow groups like Jabhat AlNusra to gain more power and prestige on the ground. Their AlQaeda allegiance should raise the alarms of all governments and push them to be more assertive in their push for an end to violence and to Bashar's madness. But at what point does it become clear that assisting rebels is not assisting extremists? How does a government determine the allegiance of these groups? When extremists are added to the mix, the equation changes. This uncertainty exacerbates the tragedy. Now that Al Nusra has made a clear statement of allegiance to Al Qaeda, it remains to be seen how that will play out. It looks like the toppling of Bashar will not be the end of the violence. Russia should play a decisive role in calming the violence. While partition of Syria is possible, a lasting peace is desirable.